Another project for the list! 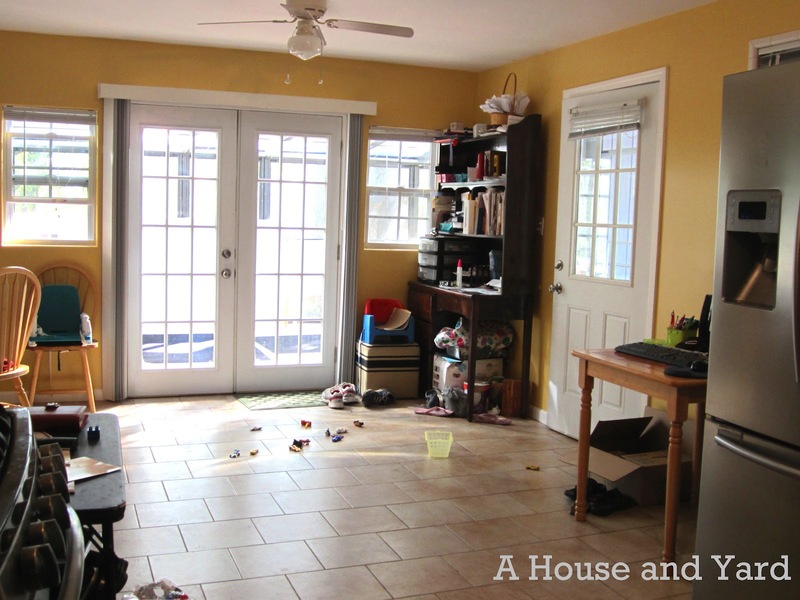 This one promises to bring order to the most used room in the entire house. Any guesses? Yep - the kitchen. Actually, just a corner in the kitchen, but it is a very important corner. You can see this corner from almost any place on the first floor of our house. Here is said-corner from the front door. Here it is from the living room couch. Of course, it can also be seen from the dining area. I know. NOT a pretty sight. 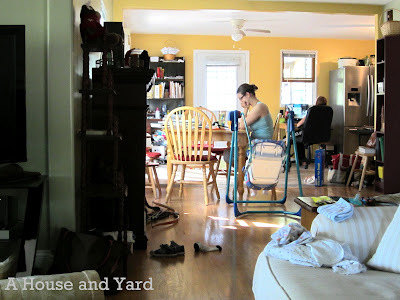 When we moved in that spot became the place for so many random things. Where does this go? I don't know. Put it on the desk in the corner! Do you ever do that? Can you believe I've lived with it this way for so long? Well...I've been busy. Sheesh! Here's the plan. Take everything - and I mean ev.ry.thing - off. Sort. Find permanent homes. Trash. Only put back those things that need to be there because I use them in the kitchen or dining room. At the moment I'm thinking that will be cookbooks, school supplies, bills and paperwork that needs processing. 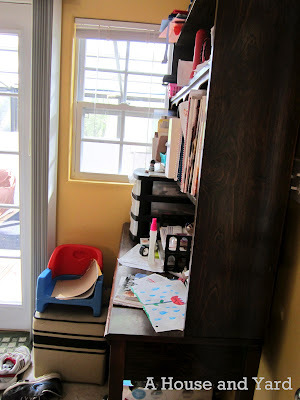 I'll either paint or paper the back of the hutch and use fabric bins for those items that need to be contained. I've been toying with the idea of painting it, but haven't decided. 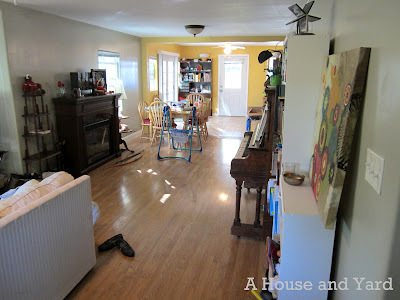 What I really want to find is a buffet and that I will paint if needed when I find it. But for now, this desk and hutch is free. It's sort of, almost an antique. My folks bought it for me in 1978 as part of my bedroom set. Here's a handful of inspiration pictures I like. On this one I like the drawers a different color than the desk, as well as keeping the wood top. I adore the peacock paint color and it appears to be glazed rather than distressed. Projects abound and I am excited to share this experience with all of you. It keeps me accountable and I 'm enjoying the interaction with those of you who have commented. So, tell me. Is there a rogue corner in your house that needs to be completely taken apart and put back together in some semblance of order? Where is it? What will you do? 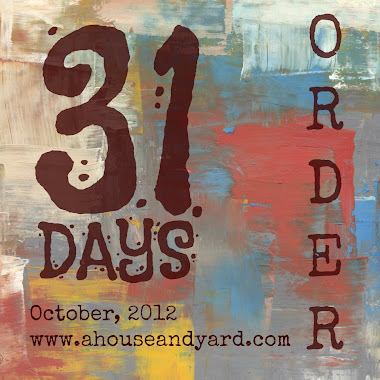 This post is part of my 31 Days of Order series. See the rest of the posts here. To find other bloggers also writing for 31 Days this month on a variety of topics, click here. "It may or may not have happened like that..." Funny!! Can I use that line sometime? I love to throw things away, too. However, they tend to pile up for awhile before I toss them. I love the teal desk. It make we want to run out and buy paint. I am pinning that one for sure. I have so many corners like that. I have to admit, I love the teal desk too!! ♥ Good luck on your renovations! Thanks for the encouragement. Updates will certainly be coming! umm....I have several corners like that. This makes me want to stay home from work and organize. You go, girl! Keep inspiring me. Thanks, Friend! See you tomorrow. The peacock paint on that chest is so pretty. Yeah, I love it too. Thanks for stopping by, Jennifer.